Electric bike conversions using Bafang BBS01 36V 250W UK road legal mid-drive motors & Samsung cell batteries. Complete conversion service transforms your favourite bike to electric pedal assist. Please note: Owing to maintenance at our warehouse and workshop, orders placed via the website between Saturday 20th April and Sunday 28th April will not be shipped until Monday 29th April 2019. Our apologies for the delay and any inconvenience this may cause. Know what you're looking for? Use Quick search..
We convert pedal bicycles into Electrically Assisted Pedal Cycles - E.A.P.C. using market leading (250 watt) mid-drive motors from Bafang® and top quality Samsung and Panasonic cell batteries. The kits are available for DIY fitting, or our complete conversion service transforms your favourite bike into an electric pedal assisted reincarnation of its former self. The beauty of the system is how little of the bicycle is changed, meaning regular servicing can be performed as normal. The difference is that a mid-drive powers from the pedals/cranks, so compared to a hub-drive motor, 250 watts of power goes a lot further, especially when it comes to torque and hill-climbing ability. Based at our workshop in Hove, East Sussex, we have family cycle heritage dating back over 65 years & stock all major components, meaning we're perfectly equipped to convert and service our E-bikes the same day. Surly Pugsley fat bike with Bafang BBS02B mid-drive motor and 15Ah Tigershark battery with Panasonic cells. Specialized Globe Carmel 03 fitted with Bafang BBS01 250W mid-drive electric motor and Brighton E-bikes Samsung 10.4Ah E-bike battery. 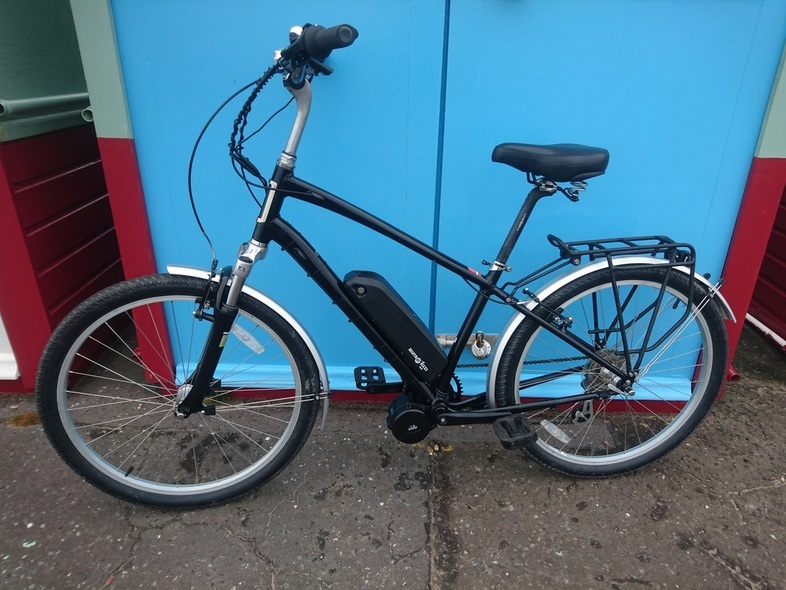 Norco Charger 7 fitted with Bafang BBS01 250W electric mid-drive motor and Brighton E-bikes 10.4Ah Samsung cell battery. Ritchey Timberwolf fitted with Bafang BBS01B 250W mid-drive motor and Brighton E-bikes 11.6Ah Samsung cell battery. One of a kind Silver Cruiser fitted with Bafang BBS01 250W mid-drive motor and Brighton E-bikes 10.4Ah Samsung cell battery. Nihola cargo bike with added va-va-voom.